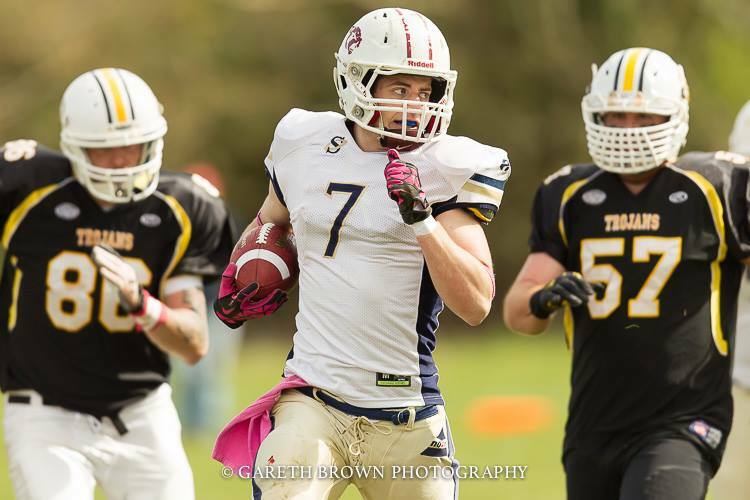 New quarterback Ben Denton and the Saints open the 2015 season with a 18-6 win over the Torbay Trojans! 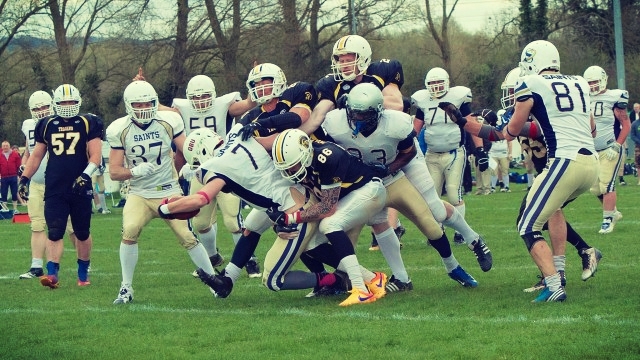 In front of a large home crowd of 100+, the Oxford Saints hosted Torbay at the Oxford Rugby Club. The Saints have spent the last four months training for the 2015 campaign, enjoying a huge spike in recruitment with many new players from the local area taking up the sport for the first time. 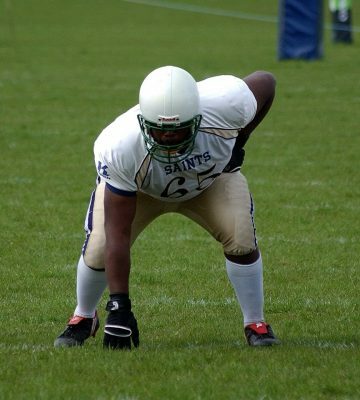 Following a league restructure, the Saints now compete in Division II South West of the British American Football Association National Leagues (BAFANL). This year the Saints will go up against local rivals Swindon and Bristol, whilst also facing tough competition from coastal teams such as the Torbay Trojans and the Cornish Sharks. 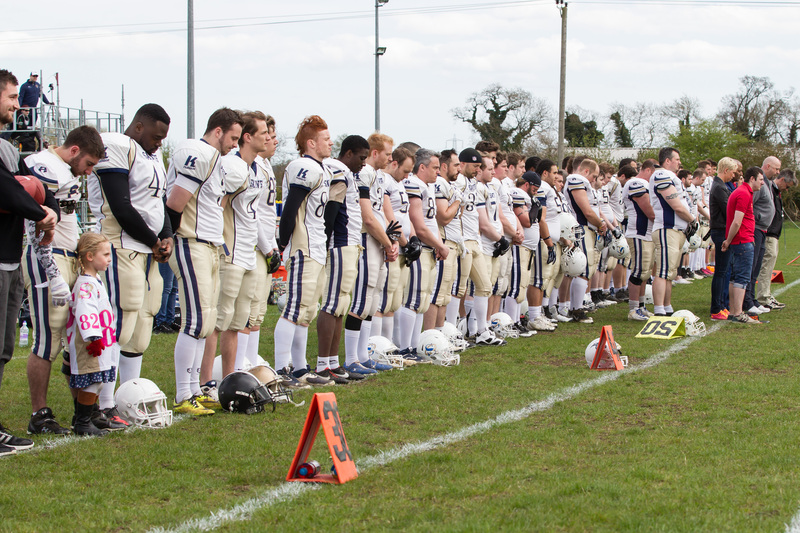 The Saints narrowly missed out on the playoffs in 2014 and will be looking to bounce back. 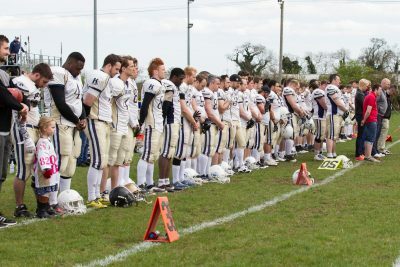 Before the opening kickoff, both teams and the supporters observed a minute of silence in respect of Saints General Manager Roger Hedges, who passed away in 2007. Roger was a huge part of the team and a memorial bench with his name sits outside the main club house overlooking the field. His daughter Kelly Hedges performed the coin toss. Under strong winds, the Trojans received the opening kickoff but struggled to move the ball against the Saints defense. The Saints offense led by new quarterback Ben Denton also struggled to find their rhythm and for most of the 1st quarter, both teams slugged it out for minimal gains due to mistakes and penalty flags. Although dry weather, the high wind presented a challenge for both quarterbacks when attempting pass plays. On the first drive of the 2nd quarter, the Saints experience and discipline began to shine as the offense marched up the field, capped off by running back Kevin Brooks scoring a 4 yard touchdown run. The Saints attempted the 2 point conversion but failed and the score was 6 – 0 to Oxford. With possession changing frequently in the 2nd quarter, both teams continued to probe each other for weaknesses. A break out run by Torbay took them very close to the red zone with free safety Ali Galbraith charging across from the other side of the field to make a goal saving tackle just short of the endzone. Fortunately for Oxford, a penalty flag was thrown against Torbay and the play was brought back. Torbay’s quarterback went to the air and attempted to establish their passing game. Although earning some completions, the Saints defense managed to hold strong and keep Torbay out of the red zone. 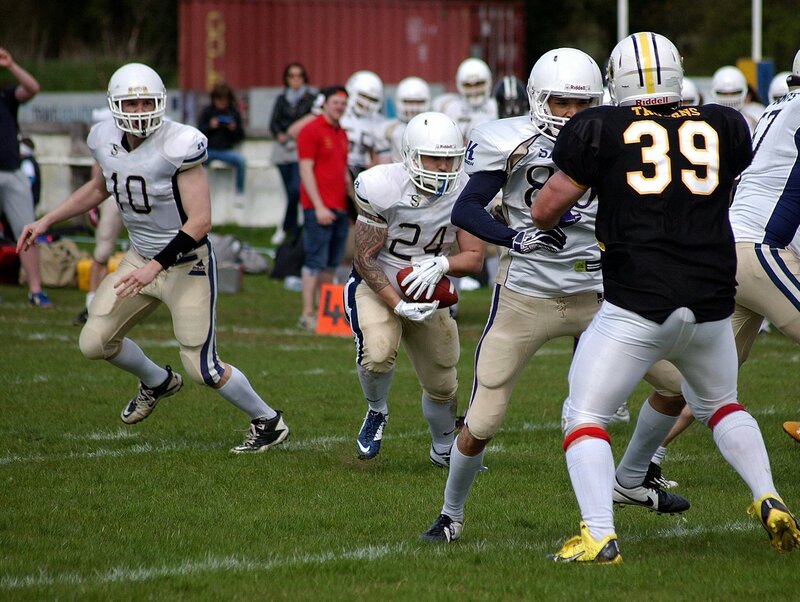 James Walter runs wild, with 157 rushing yards and 2 TD’s on 18 carries! 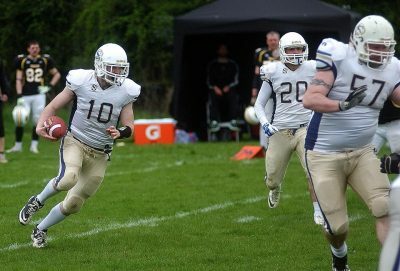 In the 3rd quarter, Saints runningback James Walter terrorised the Torbay defense with aggressive and powerful running. Failing to find a way to deal with Walter, he scored on a 10 yard run and smashed a defender into the endzone with him. This gave Oxford a two score lead 12-0. The two point attempt failed. Looking to score their first points of 2015, the Trojans responded with a good drive down the field and had the endzone in their sights. A broken defensive play gave the Torbay quarterback an uncovered receiver in in the back of the endzone who caught a easy 5 yard pass for the score. Torbay went for the extra two points and passed the ball again but this time it was covered by the Saints defense and fell incomplete. 12-6 to Oxford. In the fourth quarter the Saints needed to extend their lead. Ben Denton led another strong drive but was faced with a 4th down situation. The coaches decided to go for it and a pass to tight-end Laurent Antoine was completed for a 10 yard gain and a first down. James Walter charged the ball into the endzone again on a 5 yard run to make it 18-6. James Walter was the player of the match with 18 carries for 157 rushing yards and two touchdowns, which is more yardage then the opponents managed to gain overall through both passing and rushing. 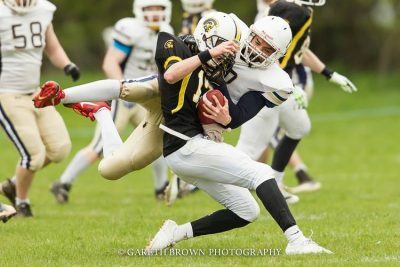 The Saints defense remained strong for the rest of the game and continued to pressure the Torbay quarterback, who suffered several big hits at the hands of Saints linebackers Luke Fry and Calvin Holmes. 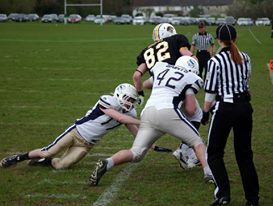 Calvin Holmes and Luke Fry sacked the Torbay quarterback three times during the game. Finishing at 18-6 to Oxford, the Saints got their season started with a win but took a while to become productive in the game. The coaches will be looking to fix this before the division favourites Bristol Apache come to Oxford on 26th April. There was also good performances from rookies who were getting game time in their first regular season game of their senior careers. Offensive lineman Tyson Blackstock and defensive lineman Conor Whitehouse both put in strong shifts. 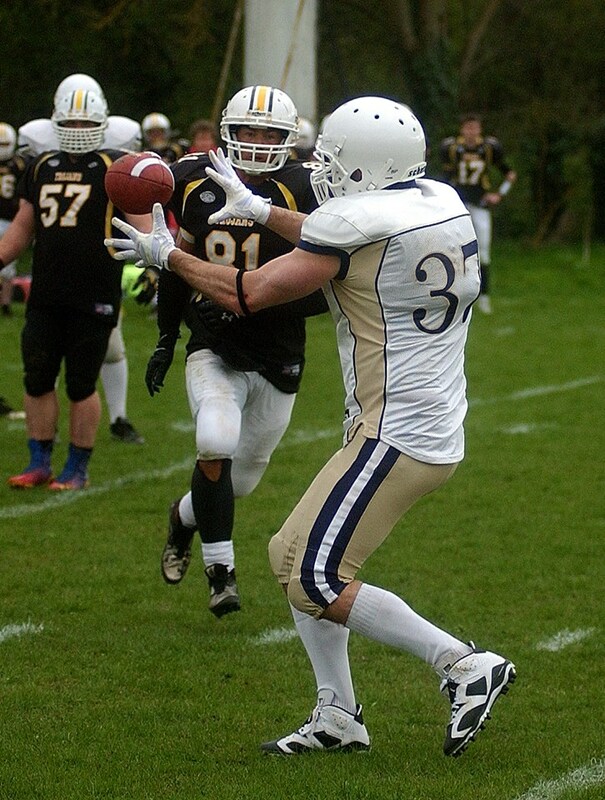 The offense was also boosted by the comeback of veteran wide receiver Sam Armstrong. Although no receptions on the day, Sam showed his experience with tough run blocking and providing a deep threat for quarterback Ben Denton. 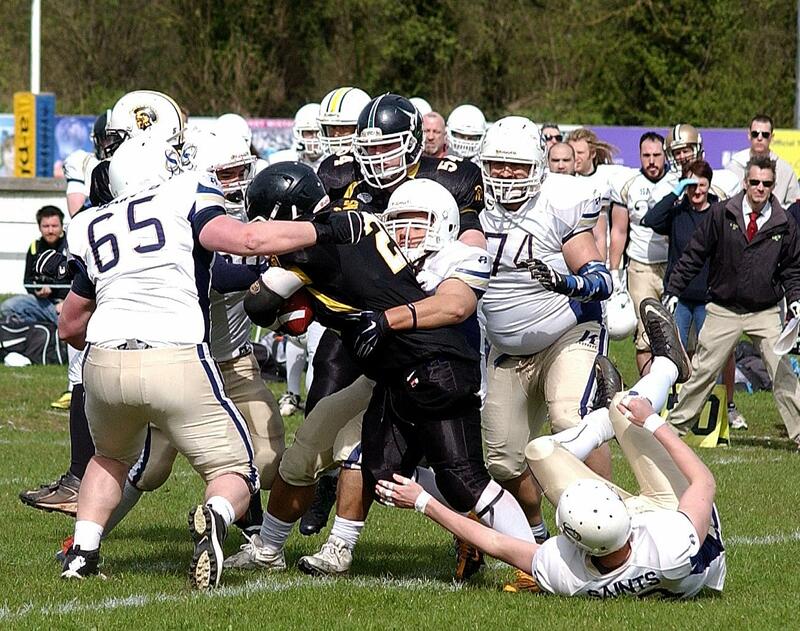 The Saints now prepare for the second game of the regular season on 26th April at the Oxford Rugby Club, against the Bristol Apache. 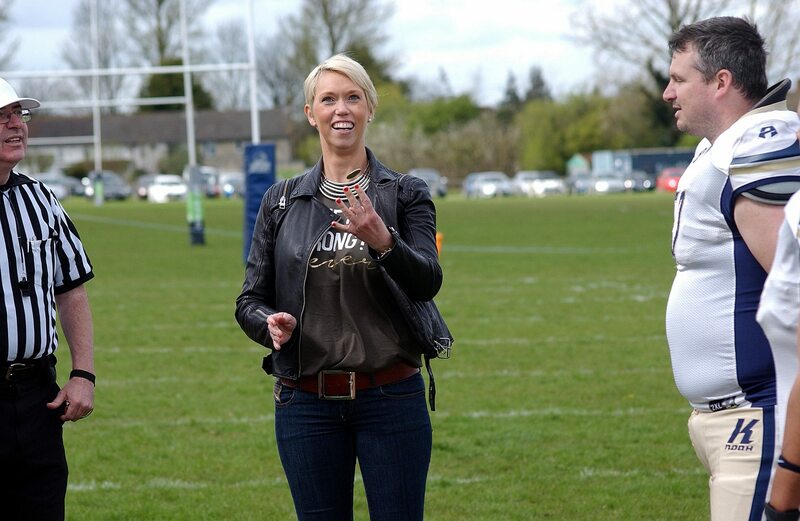 Keep a look out for the Oxford VS Bristol game preview! If you want to be part of a exciting sports team but playing isn’t for you, why not join our game day crew instead? Send a email to [email protected] and we’d happily discuss all the options!